The day after I finished knitting my silk kerchief was a cold, dark, rainy Monday. One of those days where you wish you could just stay in your warm bed and sleep late and drink tea and knit some glorious project all day while watching Pride and Prejudice or something like that. After trudging through the gloomy day, I needed a little pick-me up. I stopped by the yarn shop on my way home and picked out a golden yellow skein of Malabrigo sock yarn, which I’ve had my eye on for a couple of months. I went home and started searching Ravelry for a sock pattern. Midway through my sock-search I decided that this yarn was a little too special for socks. It’s too bright and soft and pretty to be stuffed into dirty dingy winter boots. No, this yarn needed to be something soft and pretty, like…. a shawl. A proper lace shawl, at that! 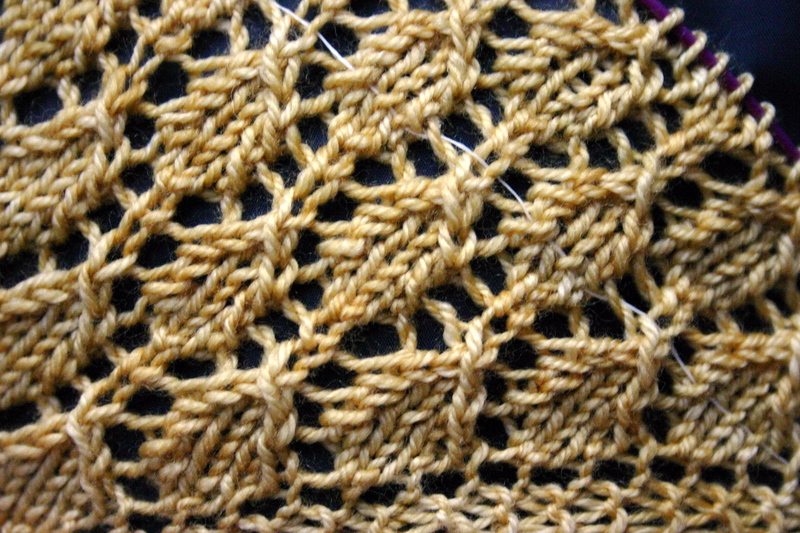 So I decided to start where it seems like lots of shawl and lace-knitters start: the Swallowtail Shawl. 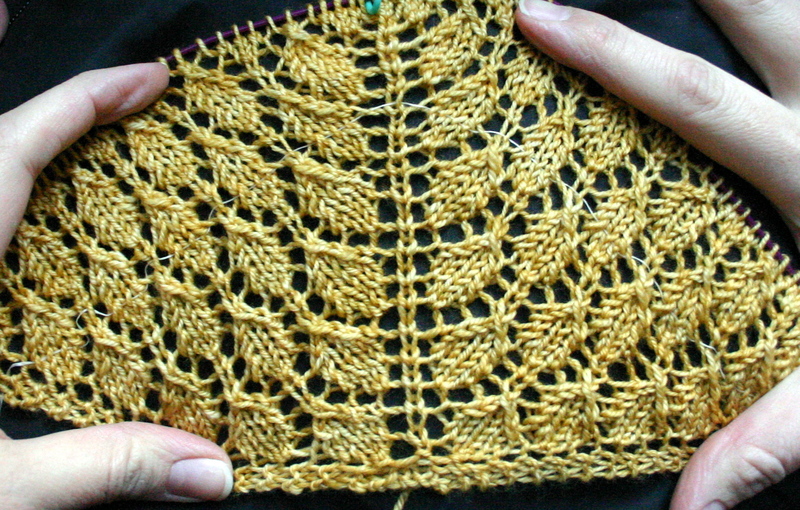 I cast on and worked quickly through the first chart of the lace pattern. Then I decided to rip it back and start again with smaller needles, so the stitches will be more dense and the open lacy areas will stand out more. So far I’m just barely into it, but I think I’m going to really like this project as long as I pay attention and use lifelines. ooh, the swallowtail shawl!! You’ll absolutely love it. I wear mine quite a bit. I don’t think I’ve ever seen “improper” lace; your is very pretty. oof! good luck with that one lady! i think if i can remember right there is one errata in the pattern but, you will figure it out with common sense.